The Naughty Nougat Mouse is an Event Mouse found during the annual Great Winter Hunt event. This naughty mouse is here to consume all the warm fuzzies this holiday season! This Winter Hunt hating mouse has found his way to the magical core of the Festive Comet itself and has infected it with his loathing of the season. This now vile pile of evilly enchanted nougat rests at the rotten core of this year's Festive Comet and needs to be removed before it is too late! Information on how to locate and capture the Naughty Nougat Mouse can be found on the current Great Winter Hunt location page. Attraction: Found after destroying the Nougat Layer of the Festive Comet. 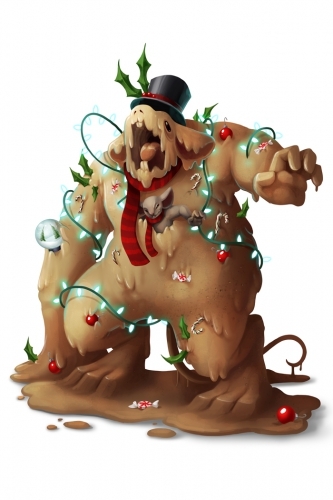 12 December 2017: The Naughty Nougat Mouse was introduced as part of the Great Winter Hunt 2017 event. This page was last edited on 18 December 2017, at 17:09.